As Masaaki Suzuki’s Bach cantata cycle draws to a close, the qualities that have made it stand out as one of the great recording achievements of the age remain as evident as ever. This, the penultimate volume, reunites many of the outstanding vocal and instrumental soloists, all of whom are still at the top of their game. The three and a half cantatas (BWV 197a is a fragment) have no obvious connections, nor are there any obvious hits among their movements, but all repay close attention, and there are plenty of surprises to be found in these always finely crafted works. Was Gott tut, das ist wohlgetan BWV 100 dates from 1734-5, although its exact purpose and occasion remain unclear. Nevertheless, it was clearly written for a celebration of some sort, as the lavish orchestration and jubilant music attest. The opening chorus is a particular treat. It is set quite low for the orchestra, and the ensemble’s colours are dominated by the flaccid but precise sound of low timpani and a low register obbligato from the flute. But the choir here is all lightness and grace, and the singers make the most of the music, which the liner rightly describes as “characterized by festive splendour and the joy of music-making”. There’s another great flute obbligato in the duet that follows and an elegant one from the oboe d’amore in the last aria. Countertenor Damien Guillon has the lion’s share of the singing. His tone is light and precise, his style distinctive but not overly mannered. Wär Gott nicht mit uns diese Zeit BWV 14 opens with a very unusual chorus. The cantus firmus theme is presented by the chorus through a complex system of counterpoint that answers every phrase with its own inversion. The result is complex and introverted, motet-like the liner suggests. It is quite a challenge for the choir, but they handle it well, giving every line of the counterpoint the clarity it requires, but without giving any undue prominence. This and the following cantata (BWV 197) both have prominent trumpet/horn parts, played with his usual flair by Jean-François Madeuf. Unlike in earlier instalments, Madeuf’s precision is not compromised by his use of instruments without tone holes, and this seeming masochism in doing so pays off in the wide array of articulations that he is able to achieve. Gott ist unsre Zuversicht BWV 197 is a wedding cantata, making it another overtly celebratory piece. 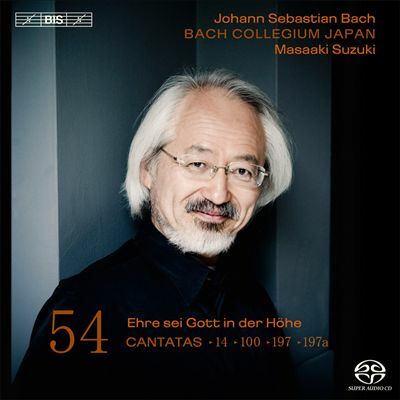 Like the wedding cantatas BWV 195 and 120a (recorded by Suzuki on Vol. 51), this cantata is divided into two sections, the later entitled, with presumably unintentional comedy, “Post Copulationem”. The recitatives are taken by bass Peter Kooij, who, despite some shaky patches in previous instalments, seems to be maintaining the quality of his vocal control right to the end of the cycle. Among the obbligatos is one for the bassoon, in the first aria, an effect as beautiful and engaging as it is unusual. Ehre sei Gott in der Höhe BWV 197a comes down to us as just the second half of a Christmas cantata, possibly from 1728. The ten minutes of music that survives suggests a joyous but intimate celebration, more in the spirit of the Berlioz l’Enfance du Christ than of Bach’s more municipal Christmas Oratorio. Peter Kooij again excels, and the lightness of the music and its accompaniment is ideal for his still nimble, if no longer large tone. An impressive recording all round then, with audio standards as high as on any of the recent instalments in the cycle. Suzuki, as ever, takes fashionably “HIP” fast tempos, but somehow always manages to make them sound both intuitive and relaxed. If the final instalment, due out in the next month or two, is as good as this one, then the series is going to end on a real high.